Eric Holt-Giménez, Executive Director of the Institute for Food and Development Policy, also known as Food First, and author of several books including his latest, Can We Feed The World Without Destroying It?, talks about what he’s been working on, thinking about and taking action around since the last time we spoke with him on Rootstock Radio. Eric Holt-Giménez firmly believes that our food system is not, in fact, broken. As he shared with us in early 2018, the agriculture system we’re operating today never really worked in the first place. Today on Rootstock Radio, we’re visiting with him again, this time about his latest book, Can We Feed The World Without Destroying It?, and to hear what other good things he’s been taking action around as executive director of the Institute for Food Development and Policy (also known as Food First). Headshot of Eric Holt-Giménez and cover of his latest book. 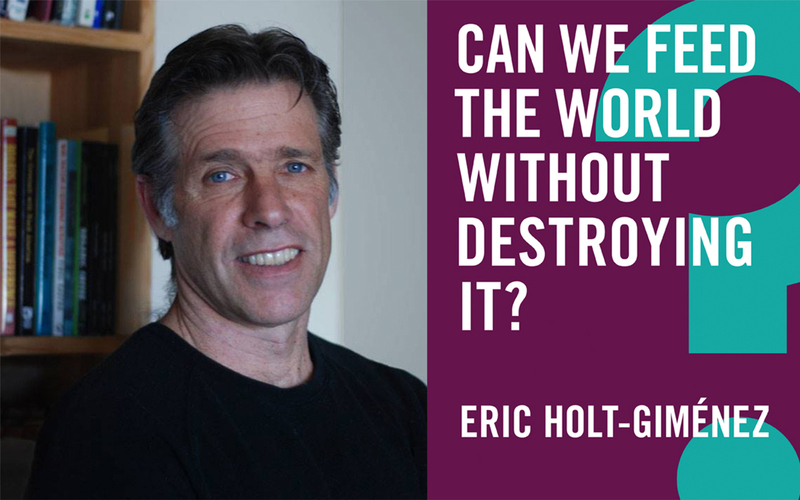 Whether Eric thinks that we can feed the world without destroying it. How our capitalist food system does precisely what it’s supposed to: overproduce, concentrate wealth in the hands of a few, and push any social or environmental concerns back on society. Why a “free market” isn’t actually free at all. How hunger is a problem of equity and poverty, not of scarcity. Why there’s no hope for transforming our food system without democracy. Listen at the link below, on iTunes, Stitcher, Google Play, Spotify or wherever you get your podcasts! THERESA MARQUEZ: Hello, and welcome to Rootstock Radio. I’m Theresa Marquez, and I’m here today with Eric Holt-Giménez, executive director of the Institute for Food and Development Policy—Food First, we all know it as. And he’s also an author of several books, including his latest, Can We Feed the World Without Destroying It? Eric, welcome. It’s truly an honor to be speaking with you today. ERIC HOLT-GIMENEZ: Theresa, thanks for the invitation. TM: You know, you’ve written several books, haven’t you? Food Movements Unite!, Food Rebel Crisis [Food Rebellions! Crisis and the Hunger for Justice], et cetera. And so this one is such a provocative title, Can We Feed the World Without Destroying It? Tell us a little bit about that title and what you were thinking when you said this is the right title for that. EHG: Well, actually, the title was suggested to me. We have co-published this book with Polity Press, who’s actually out of the UK. And they reached out to us, and basically on this theme. And they have a great Small Book series, which really appeals to me because I think more people read small books than big books. And so we came up with this title because, you know, given essentially the planetary climate crisis that we’re facing and the ongoing, sort of perpetual crisis of hunger in the world, and agriculture’s role in both of these, I think that the title, Can We Feed the World Without Destroying It, is really relevant—particularly because people have been trained to think that we sort of have to destroy things in order to feed ourselves. And when you look at the industrial food system, you see a tremendous amount of destruction. And so if that’s what you’re familiar with, you would wonder, well, gee, is there any way we can feed ourselves without destroying it? So I think it’s a very good question, and it allows us to sort of interrogate the dominant food regime, and then really look with a much more critical eye at the different alternatives that have been popping up in response, and then ask, well, why aren’t we taking those alternatives more seriously? So the quick answer to “Can we feed the world without destroying it” is yes, of course, but not the way we’re doing it now. TM: Yes! You know, it’s kind of an interesting point of view that you have about how everyone says we need to reform the food system, and you’re saying the food system never has worked. And I wonder if you’d say a little bit about that. EHG: Well, yes. I mean, there’s sort of plenty of evidence to suggest that the food system is broken, and a lot of people say we have to fix a broken food system. And there are different suggestions about how to do it: “Well, let’s vote with our fork,” for example. And I think that the premise is wrong. I don’t think that the food system is broken at all. I think that the food system is working precisely as it’s supposed to work. And to say that, one has to realize that we have a capitalist food system. And if you allow capitalism to do what it does best, what it does best is it overproduces, it concentrates tremendous wealth in the hands of a few monopolies, and then shoves off all of the social and environmental externalities—you know, damages—onto the rest of society. That’s what it does, and that’s what it does best. So that’s really not something you can fix so easily as a food system. Until we recognize that, we could sort of be seduced into believing that somehow we can change our food system in isolation of the larger political-economic system in which it is embedded. And we have to take kind of a sober historical look at things and realize that our food system and capitalism, and imperialism, for that matter, have co-evolved for the last 500 years. I mean, there hasn’t been a moment that the food system was disconnected from the colonization of the world by European powers, or by the genocide of indigenous peoples in the Americas, or the enslavement of 12 million Africans. I mean, this has all been a part of the food system we have today. And so, while most of us are appalled at some of the injustices that we see, fixing those injustices is a bit difficult until we look at their systemic cause. And this sounds like it’s overwhelming, and like, oh my gosh, you mean we can’t fix the food system until we change capitalism? Well, essentially, I would say no, we can’t. However, that doesn’t mean that we do nothing. And in fact, because of the historical co-emergence of capitalism in our food system, what we see is that how we produce our food has been really critical to the emergence of the system that we have. So our food system is pivotal, has a pivotal influence on the larger system. So changes that we can make, structural changes that we can make to the food system, will affect the rest of the system as well. So I think if we’re unhappy with sort of having to pay for the broken dishes of the capitalist system in terms of poverty and food insecurity and environmental catastrophes, actually the food system is a good place from which to address all of those things. TM: Well, I’ve been talking to my friends about the “C word,” because it seems very difficult to talk about capitalism and the free economy to a lot of people, because they don’t… Well, that’s the first thing they’ll say, is “Well, what do you mean, reform capitalism? What about the free economy?” How do you talk to people who don’t quite get this ownership concept? EHG: Well, first of all, there is no free market. And most farmers should know that; I learned that from a farmer. So there is no free market, and so to talk about free-market capitalism, what you’re really talking about is the freedom of large, multinational monopolies and oligopolies to produce whatever they want, however they want, and create any damage that they want, and do anything, and store their profits anywhere they want, without any accountability to the rest of society. Free-market capitalism doesn’t mean that we actually have free and fair markets. That’s the last thing it means. What it means is whoever has the most market power gets to set the rules, and those are the big monopolies. TM: You know, a lot of people I talk to about feeding the world will say, “Well, obviously it’s a distribution problem.” And you are very clear that in fact it isn’t a distribution problem—it’s a political problem. I wonder if you could say something about that. EHG: Yeah. So at least people are realizing there’s not a problem of scarcity, because the first big myth is that people go hungry because there’s not enough food. So that’s not true, because we’ve been producing one and a half times more than enough food for every man, woman, and child on the planet for almost half a century. We’ve been overproducing food. That’s why farmers don’t get paid enough, because the markets are saturated. So if you can get past that—because it’s repeated like a mantra over and over again by the industry in order to justify an introduction of new inputs and new seeds and new technologies and bigger and bigger farms, and this type of thing. So first of all, that’s not true. So then the next sort of step is, “Oh, so it just means that the food isn’t getting to the people.” Well, that’s right, it’s not—but why? It’s not a logistical problem. It’s because people are too poor to buy the food which is being produced. And then one has to ask, well, why are they so poor? And who are they? So then you find out that most of the hungry people in the world are farmers, and they are farmers who produce over half of the world’s food. And these are very poor farmers, most of them are women, but they are also 90 percent of the hungry people in the world. It’s a problem of equity. It’s a problem of poverty. People can’t afford the food which is being produced. They can’t even afford to buy the food which they produce. And that’s because the resources with which to produce the food are not equitably distributed. So I said that most of the world’s food is actually produced by poor women farmers. It’s not produced by the global North; it’s not produced by the big farms in the United States. That’s absolutely untrue. Mostly poor people feed poor people around the world. And so over half of the market for food in the world is controlled by very poor peasant women who, because they are poor, sell their product right away, when everybody else has got it and when the price is very low. And they can only afford to keep a small part of what they produce, and they sell the rest because they’re poor and they need the money. Six months later they run out of food and they have to buy back food on the market, but now, of course, that food is very expensive. And then they go hungry. And the other side of that is that, “Oh, well let’s give them the technology that they need.” Well, the technology is not going to help you when you don’t have enough land, or someone is stealing your water, which frequently happens. And the other thing is that it’s very difficult to make a living as a farmer when your markets are continually saturated from abroad. So we overproduce food in this country; the government buys it up at taxpayer expense, sends it to countries in the global South—you know, on the continent of Africa—and Asia. Those governments take the food free and then sell it at prices that are below the cost of production for the farmers in their country. So we basically put those farmers out of business, and then they go hungry. But then what’s happened is that we’ve captured a market. So basically what our government is doing with food aid, it’s not about feeding people. And you can actually go to the website of Public Law 480 and it’ll say this. It’s about expanding our markets. But to expand our markets, we have to destroy the markets and the food systems of the countries where we want to sell our products. So this is what creates hunger. Here we think we’re feeding the world because we’re producing more and more food—in fact, the opposite is happening. TM: If you’re just joining us, you’re listening to Rootstock Radio, and I’m Theresa Marquez. And I’m here today with Eric Holt-Giménez, executive director of the Institute for Food and Development Policy—Food First—as well as the author of many books. Someone recently said to me, “Well, democracy took out communism, and now capitalism is taking out democracy.” Is the idea of democracy, can we approach this transformation through trying to figure out how to bring back our democracy and start looking at more of an equitable ownership? Where would we begin with this? EHG: Well, I think you’re right. I would also say I don’t think we can possibly… I don’t think that we can bring about any transformation of our food system without democracy—that that is what’s at stake, and it also is what will allow us to bring about the transition which we desperately need. I mean, the United States produces more food than anybody in the world except for China and India, and yet one in seven people are going hungry in this country. And most of them work in the food system, including many farmers. So this is economically undemocratic. It’s not equitable. How do we address this? I mean, just look at the Farm Bill, for example. We don’t vote on the Farm Bill, and yet it’s the most single important piece of legislation in the entire food system, in the global food system. It sets the price for grain around the world. It decides essentially who’s going to make it and who’s not going to make it. It basically has presided over the disappearance of the middle-size farms in this country. And yet none of us vote on that. And certainly, in terms of political power, farmers have lost almost all of their political power to engage in a democracy. They’re less than 2 percent of the population. We have more people in prison than we have on the land. And so where… I think the flip side of democracy, in terms of just voting and what-not, is actually the construction of equitable power relationships. Otherwise the vote doesn’t get you far enough in changing things. But we can’t do without it either. So it means exactly what it meant during the last major crisis we had in this country, which was the Great Depression. It means instituting massive national programs which, at their core, are trying to reestablish equitable relationships between people and the market, and people and society. You know, before, this was really led by farmers. One out of five people in the workforce, or a quarter of our workforce were farmers back in the ’30s. Farmers had their own political parties. Farmers were able to argue for parity. Roosevelt had to take them seriously. And when he, after the great financial crash, Roosevelt is taxed with rebuilding our country, and saving our country, essentially, from crashing, he starts with agriculture and starts with supply management and starts a food program and starts with the Conservation Corps, and basically re-invests in the countryside, a massive, massive re-investment in the countryside to try to reestablish social parity between farmers and everybody else. And it was wildly successful. Why? How was he able to do this? He had all of the robber barons lined up against him, had all the monopolies lined up against him. How could he possibly do this? He did it because there was powerful social movements on the ground that created the political will to institute these reforms. So that’s the part of democracy that we don’t usually talk about in this country. But if you think about the liberational and progressive reforms that were ever introduced into our society, be it abolition, suffrage, civil rights, it has always been the result of a combination between working with the existing structures of democracy and the power of social movements demanding and getting the reform from politicians. And I think that’s where we are again today. I mean, we started off talking about these very big questions of capitalism and food systems and global food systems and what-not, and where do we start? I mean, once we get past the organic agriculture and urban gardens and the CSAs, and all these things which are very important to address the immediate problems of food insecurity at the community level, when we begin to look at the structural changes that are necessary, then that requires the power of social movements and deep reforms, and deep reforms to the Farm Bill. The thing is insulated by committee after committee. They won’t let us touch it. It’s a pillar of late capitalism. Well, we’ve got to change that. And I think that it’s very interesting to see the Green New Deal getting so much traction, even though it’s a resolution—it’s not even a law. It’s writ large, it’s very kind of vague. But people are tumbling into it because they see this as sort of a catalyst around which the deeper social and economic reforms which this society desperately needs can begin to build, crystallize and build. And so I think that it’s really important to look back to the original New Deal and the importance it placed on agriculture as fundamental to all the other changes for the reconstruction of society. We have to consider that again with this Green New Deal. Yes, now there are less than 2 percent of our population are farmers, but that doesn’t mean that farming is any less important than it was back in the 1930s. It’s even more important. So how do we construct the power of social movements if we don’t have enough farmers? Well, we have a larger food movement; we have people in the cities growing food; we have people organizing in the food sector, whether it’s in the processing plants or whether it’s in the restaurants. So we actually have a very far-flung, broad-based food movement that overlaps with the climate justice movement. And so we need to build alliances between the food, farm, and climate justice movements to try and build that social power that we need to create the political will so that these reforms which are being proposed, and very exciting resolutions like the Green New Deal, actually are the right reforms that we need, and that we actually include the rural sector. We have to get people back on the land, not empty the countryside. We have to make the countryside a good place to live. And that means we need a social investment in the countryside. We need to raise the social wage in the countryside, and then we need to control, we need to internalize the externalities so that that part of agriculture which is polluting—spewing greenhouse gases, guzzling all the water from our water tables, and contaminating the Gulf of Mexico with these algal blooms—we need them to pay for that. That will level the playing field between small and large farms. And we need to find ways to open up access for young farmers. Right now the barrier to access is land. It’s very difficult to get into farming; it takes a lot of money. Well, we need to turn that around. We really need to prioritize the countryside. And I don’t think it’s expressed deeply enough with the current language within the Green New Deal. That shouldn’t be a surprise—it was written mostly by urban people. But they have left a tremendous opening, and they’ve especially left an opening to have a public debate and an informed conversation about what kind of food system we want, and which sort of incentives and disincentives should we bring into the reforms that we need, in order to ensure the type of food system that will both cool the planet and distribute the resources much more equitably. TM: You know, it’s so wonderful to, in some ways, to hear we have solutions, we know what to do, even though I can’t see that any of these wonderful ideas of transformative reforms that we need can happen under this administration. Do you think that we’re getting a good wakeup call, that that’s a real possibility though, that we could actually say wait, not this—we can do this, and it’s opening up an opportunity perhaps? EHG: I think we have to act as if it is. I think the responsible thing to do is to adopt that attitude. You know, so much of this has to do with hearts and minds. Why has our democracy eroded like this? In part it’s because we’ve allowed it to, in part because within… Liberal democracy has also co-evolved with capitalism, and it’s always a balance between private interests and public interests. And in fact, even our public interests and public goods and public service and what-not reinforces, has always reinforced, private enterprise. And you can’t have private enterprise without public goods. I mean, you can’t have private enterprise without public roads or a public army or any of these things. So there’s always been a balance. And what’s happened is that it’s way out of whack right now for a healthy society and a healthy planet. We’ve had 40 years of liberalization, and it’s just about destroyed our democracy and is just about destroying our planet. So this has happened. Historically, this is how it goes: There’s a period of liberalization where the gloves are taken off the market and the big players do whatever they want, and tremendous concentration of wealth; and then you have a big crash. And then, if there is enough political will and people are organized enough, then you can introduce reforms. So this has happened over the last 40 years, basically starting with Ronald Reagan and Margaret Thatcher liberalizing the economies. They call that a “free market” but we already mentioned that’s a misnomer. It’s just basically taking all the regulations off the big corporations—that’s what it is. And they’re destroying us. So how do we get… You know, and then we have this big crash, and then we don’t get any reforms. And we don’t get any reforms because we didn’t have the strong enough countermovement to force the reforms. So I think these reforms are essential, not just for dealing with the problems of food security and the environmental problems that we have, and global warming and what-not, but it’s also important because we have to reconstruct our democracy. It’s really in tatters at the moment. So yes, and then where do we start? We start where we have to start, which is usually locally and with our local governments and local food policy councils. And we change those rules that we can change as we build social power and alliances to change the rules which we cannot yet change but have to. And I would say the other thing is that, because this is such a vital and tremendous undertaking, people get dispirited. People lose hope. And looking at things, I think that’s reasonable. I’m not an optimist. Things are bad, and the future looks bad. So I think anybody that’s an optimist about that is really not paying attention—or is very, very rich. But that’s not the same as hope. Hope and optimism are not the same thing. Optimism is you do something because you’re confident in the outcome. We can’t at all be confident in any outcomes at this point. But hope means you do something because it’s the right thing to do. And so who is it that doesn’t lose hope? The people who don’t lose hope, around the world and in this country, are those for whom giving up hope is not an option. So we need to ally ourselves with those people, and we need to support their leadership. And those are the people who are most damaged by the present food system. All right? These are women, people of color, immigrants, family farmers. These are the people for whom giving up hope is not an option. And so that is the spring of our leadership. And we need to support those folks, and we need to develop new forms of leadership appropriate to this task of converging in diversity and building political power to create political will. TM: Well, Eric, it’s been great talking with you today, and thank you so much for all the great work you’re doing with Food First. EHG: Well, thank you. And I think that your program is really very important, because we need to open up the public sphere again and have these conversations, and not let the market make all our decisions. We have to start making the decisions. And for that, we really need this kind of dialogue. So thank you.